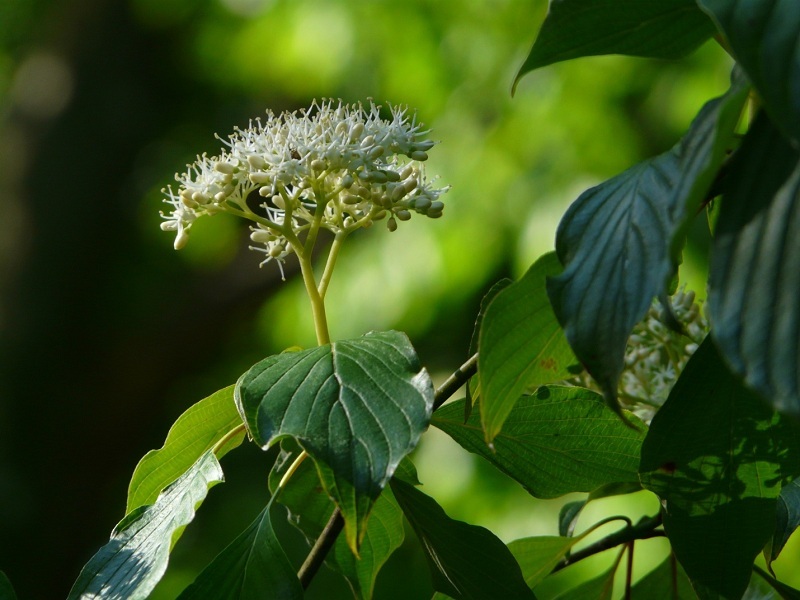 The Alternateleaf Dogwood is a small flowering tree that grows 25-30ft tall. It is named for its alternate arrangement of leaves which differs from other dogwoods which all have opposite leaves. 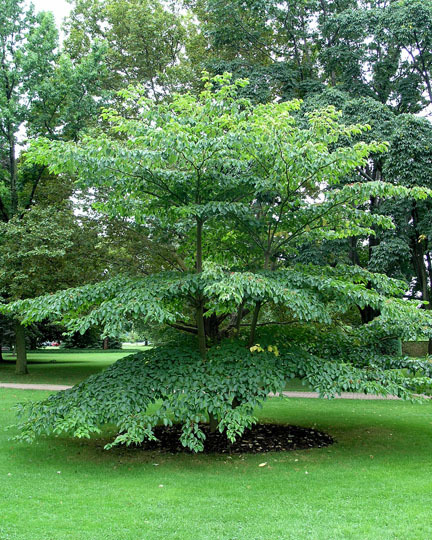 The tree may also be referred to as the Pagoda Dogwood. This name describes the horizontal branching pattern of the tree which resembles the architecture of a pagoda and gives the tree a structural form that stands out in the landscape. This dogwood’s small white flowers are more delicate than that of Cornus florida (Flowering Dogwood), but they are numerous and arranged in large clusters that can be 2-3” across. The glossy leaves in summer will eventually turn to maroon in fall, and the small fruit grown throughout the summer will ripen to dark blue drupes and serve as a coveted food source for wildlife. This tree is frequently wider than it is tall, and can be used to fill an area with its interesting form. With horizontal branching structure in the winter, white clusters of flowers in late spring, glossy green foliage in the summer, and good maroon color in fall, the Alternate Leaf Dogwood is a tree with multi-season interest that can be used as a stand-alone specimen or as part of an understory planting. The Alternateleaf Dogwood is a partial shade plant that grows best in moist soil. While the tree will produce more flowers and stronger fall color in more sun, too much sun will stress the tree and increase the risk of pests and disease. Powdery Mildew, Leaf Spot and Dogwood Blight are some of the diseases that can be found on this dogwood, however, these are not typically devastating, and should not steer you away from this highly ornamental native.